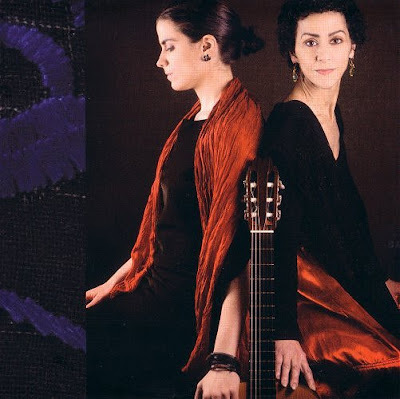 Soundtrack for this post is provided by Greek songbirds Angélique Ionatos and Katerina Fotinaki, seen above, with a delicious programme of duets with guitar titled Like A Garden At Night. Yet another outstanding album from French label Accords Croisés, the record company that refreshes the parts other labels cannot reach. Particularly noteworthy on the new disc are two tracks by Greek composer Manos Hadjidakis. Despite composing the Academy Award winning score for the 1960 film Never on Sunday Hadjidakis is not well known outside his native Greece, even though he lived in exile in the US for six years during the Greek military dictatorship. He was a close friend of Nino Rota, Nicolas Piovani and Astor Piazzola and promoted their music in Greece. More on musicians' resistance to the Greek military junta here while Paul Bowles records Jewish music in Morocco here. The Paul Bowles quote comes from his journals and is published in Travels: Collected Writings 1950-93 which was borrowed from Norwich library. Like a Garden at Night, which comes with an excellent accompanying DVD, was bought at retail. Any copyrighted material on these pages is included as "fair use", for the purpose of study, review or critical analysis only, and will be removed at the request of copyright owner(s). Report broken links, missing images and errors to - overgrownpath at hotmail dot co dot uk Also on Facebook and Twitter.